Editor’s note: This document is from a series of papers describing Copiosis Economies. We felt it timely since we’re coming into the Holidays. Christmas is fast approaching and we see the Salvation Army out with their kettles and bell ringers. It is the time of the year when we think of contributing to charity so that poor children can have at least one happy day in the year. Contributing to charity can make us feel good in several ways. We can consider it another step toward a heavenly reward. We can consider ourselves to be generous to those less fortunate than ourselves. It makes us feel superior and in charge of our own destiny. It gets those annoying solicitation people off our porch so we can go back to the football game. But that is now with our traditional economy and ability to give money to others. What about in a Copiosis economy. Copiosis money cannot be given to others and all it will buy are Luxury goods and services. It hardly seems like charity to give someone a Luxury. Charity feels like giving food or clothing or a place to live to the destitute. Charity doesn’t feel like giving someone tickets to see the latest rock goddess gyrate on stage. So imagine yourself in a Copiosis economy. You have extra food which you give to some hungry people. And you get paid for doing so. Well, that sort of takes away the sacrifice on your part. You have clothes that you don’t expect to wear any more now that you have lost that extra 20 pounds so you give them to those who need clothes. And you get paid for doing so. You take care of a child while the child’s mother works. And you get paid for doing so. Where is the charity in doing things that get you paid? Is this the death of charity? Does this mean that those who are kind to their neighbors will lose that feeling of moral superiority? Perhaps they will. But you can always keep your giving to others secret. The Bible has something to say about that. Something about not letting your left hand know what your right hand is doing? If you want to feel noble and self sacrificing, you can always hide your good works. So much for individual charity, what about organized charity? What about organizations like the Salvation Army? In the early days of The Transition from a traditional economies to Copiosis the charity organizations would be given quite a bit of food and clothing and (for the medical community) drugs and other medical supplies because there would exist millions of poor who will need such things as they need them now. It would take a while to set up the distribution apparatus (stores and such) for the food and clothing that will be made available to the poor. While that is being arranged, the traditional charities will be the backbone of such distribution because they have the knowledge and the organization to get the distributing done. They and those who contribute the food and clothes (probably from the huge agribusinesses and clothing manufacturers) will be paid for their efforts when the poor eat that food and wear those clothes. But we are drifting away from our topic. These organizations which are considered to be “non-profits” would still be non-profit but would also still earn money for those who contribute their time and effort based on the good they do. And that doesn’t look like our traditional view of charity, either. So in one sense, charity would almost become a thing of the past, something that our descendants might come to wonder about as a strange concept. 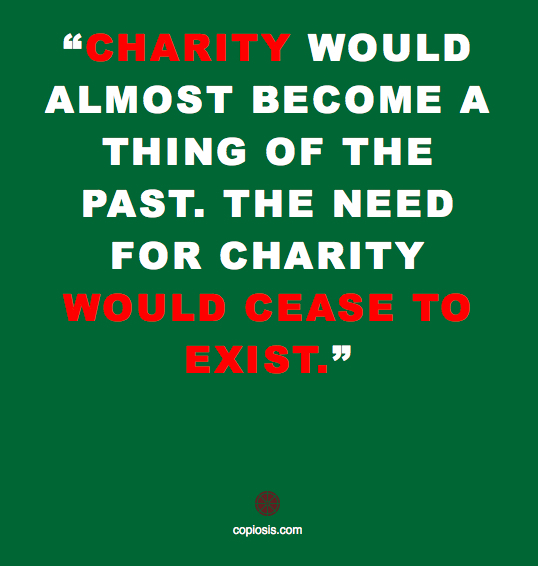 The need for charity would have ceased to exist. There would be no poverty in the sense of people who did not have access to adequate supplies of the necessities of life. There would simply be no more need for charity. The actions which today are considered noble would be, rather, considered practical and another way to make money. Christmas will never be the same. That will be a loss. But on the other hand, there will be no more Tiny Tims who will die unless some wealthy person decides to take pity on them and pay for the medical care they so desperately need. There will be no more babies that have to be born in a stable and laid in a manger because there is no room. There will be no more poverty stricken families with children who will get no toys unless those more fortunate than themselves donate. In short, it will be better when charity is no longer needed. Copiosis is an innovation that eliminates market externalities, spurs innovation, and holds people accountable for their actions like nothing else in human history. It redefines money and how money is used in day-to-day transactions while restructuring the Free Market and how it works. Human beings are entitled to Human Sovereignty. The theory of “Human Sovereignty” states that individual human beings have independent authority of their bodies, their bodies are off-limits to others unless authorized by the individual. Individuals cannot be coerced or pressured to do something against their will. Human Sovereignty comes with Basic Needs, meaning all human beings have access to basic food, basic clothing, basic shelter, education and healthcare at no cost to them as needed for their basic survival and ability to thrive. The Free Market for goods/services should operate in an unrestricted manner, but should be designed to curtail negative externalities or systemic abuse. The Free Market should promote the best behavior of Humanity. Some Human Behavior is more desirable than others. It may only be owned by individual human beings. It is a completely virtual currency. It cannot be transferred from one person to another. It may only be taken from the owner with their permission.